The development of enantioselective catalytic processes is the most sophisticated art in chemical science especially green technologies. To address the sustainability issues, in existing manufacturing processes and producing new chemicals, researchers should develop alternative technologies to eliminate toxic chemicals, wastes, and by-products. Asymmetric photocatalysis is an appealing candidate for these innovations as it opens up new ways for synthesizing chiral complex molecules, in a cost effective and sustainable manner. With respect to single catalysts, to date, chiral photoredox catalysts is represented by only two examples of chiral Ru- and Ir-complexes, but a general solution for stereoselective, visible-light induced photoredox reactions with single molecule catalysts represents a long standing challenge and is highly desirable. Therefore, the main objective of this proposal is to develop chiral dyes for enantioselective photoredox catalysis under visible light irradiation. We propose to converge in one, purely organic molecule: photoredox catalyst, a chiral scaffold and substrate docking site. We hypothesized that designed, suitably tailored dyes will simultaneously photoactivate substrate and control the facial selectivity. Newly prepared catalysts will be tested on a model reaction of tetrahydroisoquinoline with malonates but other nucleophiles will be used as well. Subsequently, the approach can be expanded to other amines and ultimately other reactionsâ types. Concurrently, the basic scientific knowledge about asymmetric photocatalysis in general will be vastly expanded. We envisaged that converging photoredox properties, a chiral scaffold, and a docking site in one organic dye will give access to the desired photoredox catalysts. 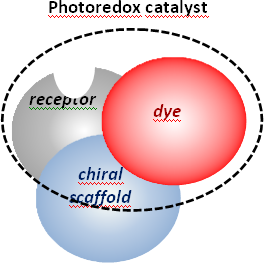 The proposed design of PHOTOORGANOREDOX catalysts will be made on the basis of several prerequisites: it must be an organic dye, must absorb visible light, have high first reduction potential, be chiral, possess binding sites for a substrate, and be catalytically active. It is planned to use known dyes (rhodamine type dyes, perylenebisimide, 10-phenylphenothiazine derivatives) as platforms for the preparation of chiral dyes via their functionalization with chiral moieties. Additionally, groups for substrate binding will allow fixing the starting material in the chiral environment. Once synthesized, our newly developed catalysts will be tested on a model reaction of Scheme 1. Model reaction. tetraisoquinoline with nucleophiles (malonates). Subsequently, a general method will be elaborated via an in depth analysis of all aspects of the reaction. Following a full breakdown for the design, synthesis and model reaction, other photoredox-catalyzed transformations will be tested by examining various nucleophiles. Then, the established methodology will serve as a background for the development of unknown enantioselective reactions. Such a general approach will assure marked input to the photocatalysis field. The implementation of this research proposal will provide new green, sustainable, synthetic methodologies, will give new insights into asymmetric photocatalytic synthesis under visible-light irradiation, and will pave the way for the development of new photochemical processes. The idea proposed in this project has never been explored and is significant from the point of view of not only of synthetic chemistry but also green and sustainable chemistry. The concise and general approach will substantially expand our knowledge on asymmetric photocatalysis and will open new opportunities for the application of photoredox catalysis in not only organic synthesis but also in chemical industry.